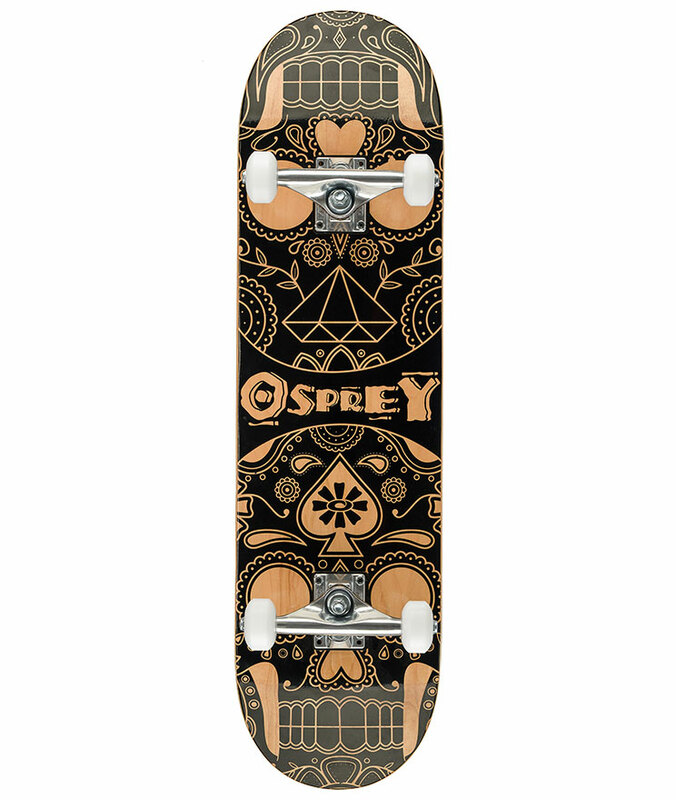 The Osprey Heritage Twin Tip Longboard features an eye-catching typographic design on a concave, wide and forgiving deck. The wide deck cradles the feet making it super stable whilst the concave deck gives the rider even more control of the board, making it a great board for beginners. The Heritage Longboard is specially designed as a Twin Tip which eliminates wheel bite. This means that you can make some really deep carves without the wheels grinding on the deck. 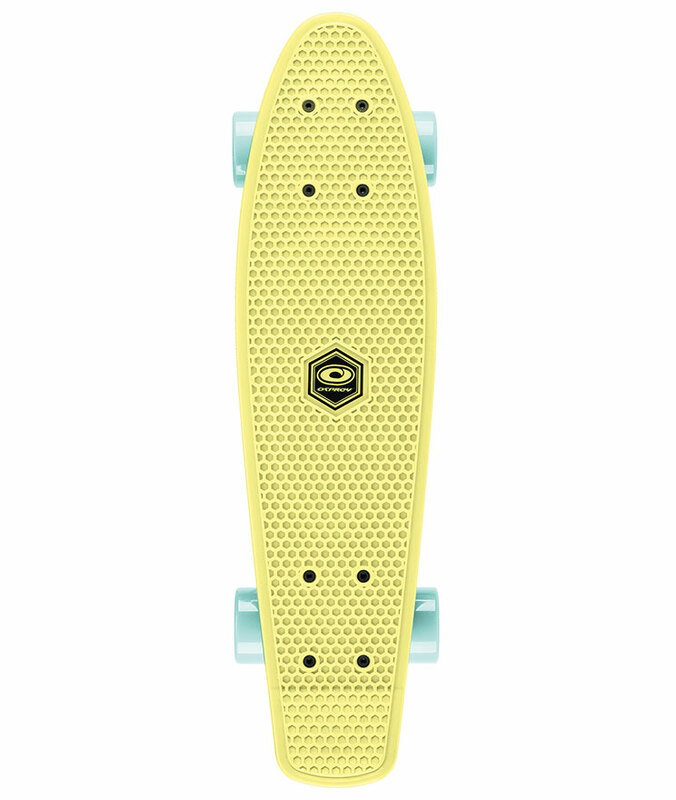 The other great feature of the Heritage longboard is its drop through truck. This design gets you closer to the ground and in turn, helps you feel secure and stable. 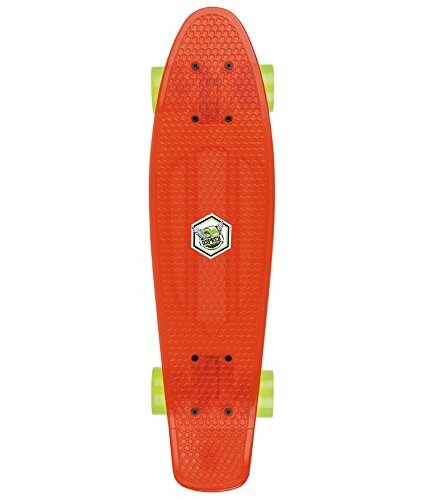 With unique translucent orange wheels and high quality ABEC 9 bearings, this is a great all-round longboard perfect for all abilities. This is a versatile directional carver straight out of Jamaica, with a shattered glass Rasta design getting you from A to B in style. 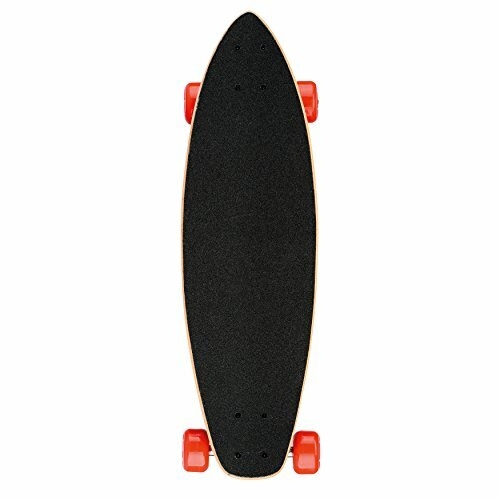 The Shape Longboard’s concave deck makes this a comfortable pavement pusher whilst the wide truck base give wheels plenty of clearance to avoid any wheel bite when carving. The board’s flexible deck softens the blow on rough concrete for a really smooth cruise to your final destination whilst its drop through trucks give a secure, controlled and stable ride. 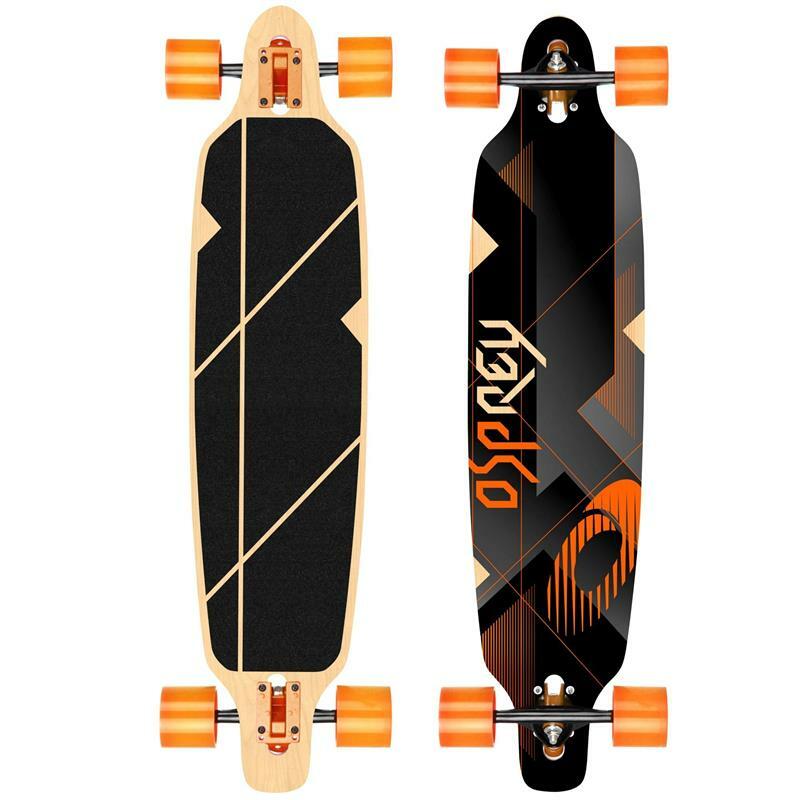 The Nexus Twin Tip Longboard by Osprey is an awesome directional carver with plenty of deck space to fool around on, whether you’re free-styling, boardwalking, cross-stepping or just playing around with weight distribution. 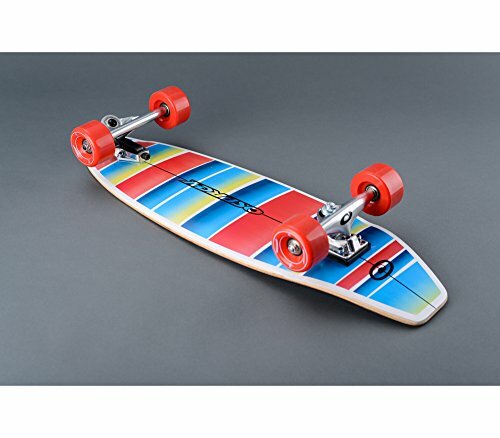 Its wide forgiving shape cradles feet and gives you the feeling of being locked in, giving you more confidence as you’re learning the ropes, making this a perfect longboard for beginners and advanced alike. This board’s twin tip design is great for having a go at some flat ground tricks as well as eliminating wheel bite on deep carves. 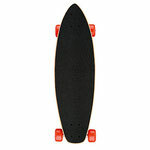 The Nexus’s concave, flexible deck and drop through trucks make for a controlled carve and super smooth cruising ride. The Nexus’s name, as its design suggests, is all about connections linking things together. As your existing skills link in with this board, your new and increased control of the board will help you to fine tune your carving abilities. Ready grip taped, with wheels, trucks, bushings and bearings, this trick board is ready to take to the park from the moment you unwrap it. It’s been put together with park and street skating in mind, with hard wheels for the smoothest glide over warehouse floors and smooth concrete. Standard trick board sized wheels and aluminium trucks keeps this board light, for easy pop, with a double tail kick and concave deck for good foot control and easy placing. Made of 7 ply maple, the deck sandwiches 2 ply of premium Canadian maple between a Chinese maple core, for a strong and great value deck. Chrome ABEC 7 precision bearings and 99A (Hard) bushings give this board the quick acceleration speed it needs without the speed wobble. - Double tail kick and concave deck for easy control and doing tricks. With a dark and deadly allure, the Osprey Candy Skull 8” skateboard takes inspiration from the intricate designs of Mexican ‘Day of the Dead’ sugar skulls. The two tone design captures the gritty beauty of skateboard art with being grim, and shows through to the grain of the maple deck. As a complete skateboard setup, the Candy Skull double kick skateboard comes fully assembled and ready grip taped, with wheels, trucks, bushings and bearings, ready to hit the street from the moment you unwrap it. It’s been put together with park and street skating in mind, with hard wheels for the smoothest glide over warehouse floors and smooth concrete, and kick tail and nose for skating switch and popping tricks. Smaller wheels, standard for trick boards, and aluminium 5” trucks keeps this board light, for easy pop, with a concave deck for good foot control and easy placing. Chrome ABEC 7 precision bearings and 99A (Hard) bushings give this board the quick acceleration of speed it needs without the speed wobble. Made of 7 ply maple, the deck sandwiches 2 ply of premium Canadian maple between a Chinese maple core, for a strong, durable and great value deck. While this board is perfect for beginners just skating around, it can do more than just roll around, as you progress from ollies to flip tricks to popping stairs, dropping ramps and slides and grinds. - Wicked two tone graphics inspired by Mexican sugar skull designs give this skateboard a dark and deadly allure. - Perfect street style art. Looking for a skateboard produced to the highest specifications and capable of all the tricks, flicks and jumps in the book? 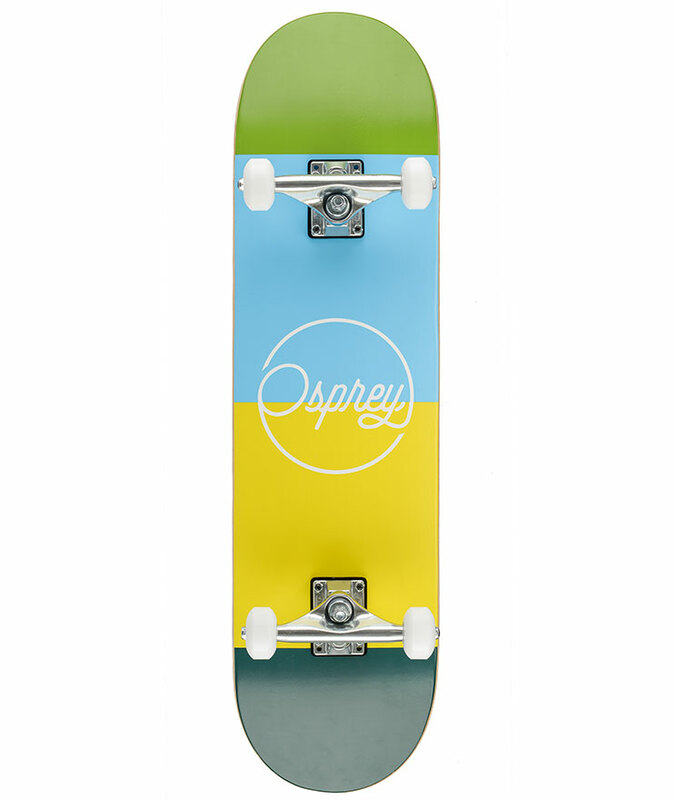 Then say hello to the Osprey OSX Pride Skateboard! The skateboard's deck has been made using a quality 7ply wood design of Chinese and Canadian maple. Thanks to its double kicktail deck, tricks and ollies are possible from the word go. The upper deck has been covered with black grip tape to give greater control and stability when riding. The deck also has a concave midsection, allowing flicks, heelflips and other tricks to be executed. 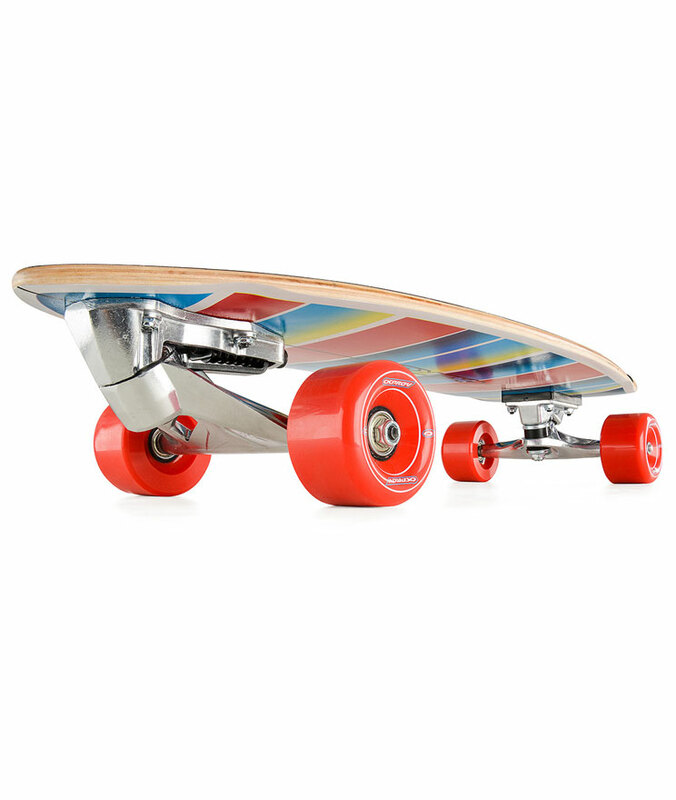 The skateboard's V-style trucks are coloured a funky shade of blue and are attached to the board with cushions and bushings to improve manoeuvrability. 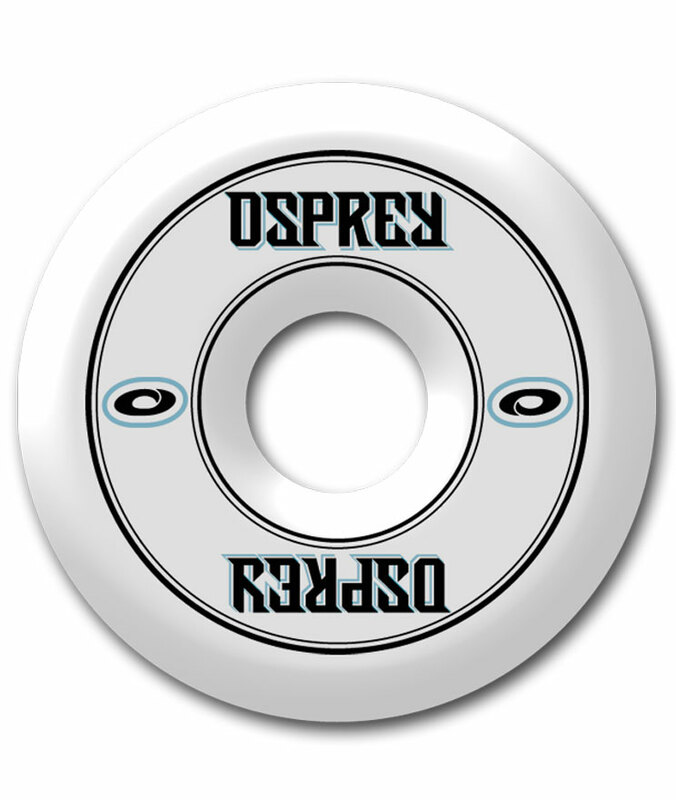 As well as being decorated with funky Osprey logos, the stylish white wheels are fitted with ABEC-7 chrome bearings which reduce friction for a slicker, quicker ride. If you're looking for a skateboard that cries out to be ridden and executes tricks and jumps with ease, then the Osprey OSX Pride offers the complete package. 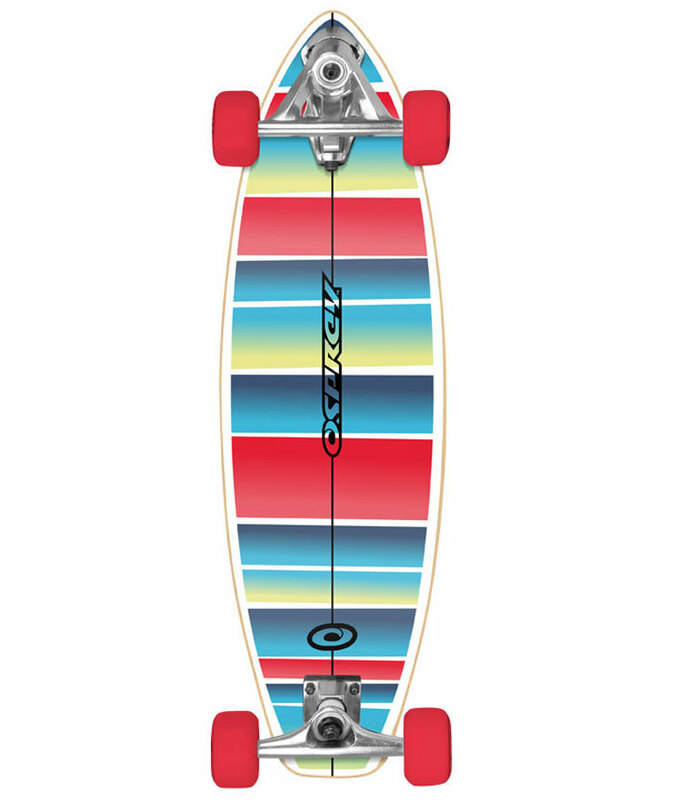 The Osprey Stripe Carver Skateboard is a complete single-kick board which is a huge trainer for your legs. A really fun board which, thanks to its short length, can give you really tight turns and allows for effortless pumping, even when the waves are flat. This is a board that really blurs the boundaries between surf & skate; make smooth sweeping turns and use hilled driveways as the face of the wave to imitate snaps, slide out the tail for an accurate surfing cross-trainer. Not only can this board help you hone in your surfing skills, its wide design also makes this a great cruiser for when you just want to roll around with your mates. Small and compact enough to carry around or strap to your backpack when going to college or work. - The Complete Single Kick Carver! 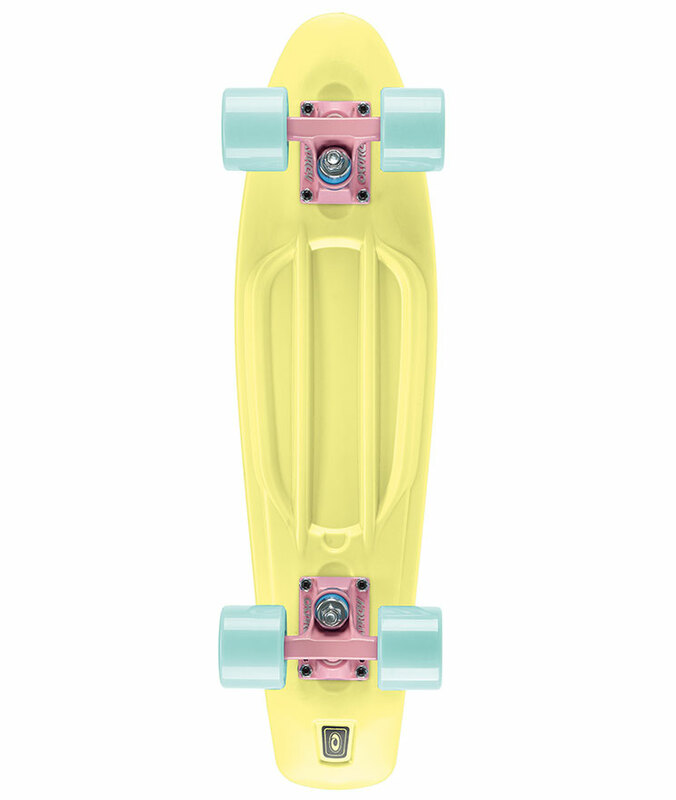 Our plastic cruisers have never looked so sweet, with fresh sorbet colours enough to give you a sugar rush. Pastel lemon yellow rolls together with mint and strawberry for a tasty treat for your feet. This 22in mini plastic cruiser skateboard is mixing this fresh colourway with a retro shape, harking back to the days of the Z-boys and dog town, with one vital update! Soft, super high rebound (SHR) polyurethane wheels ensure the smoothest glide, from easy street cruising, to climbing pool walls. 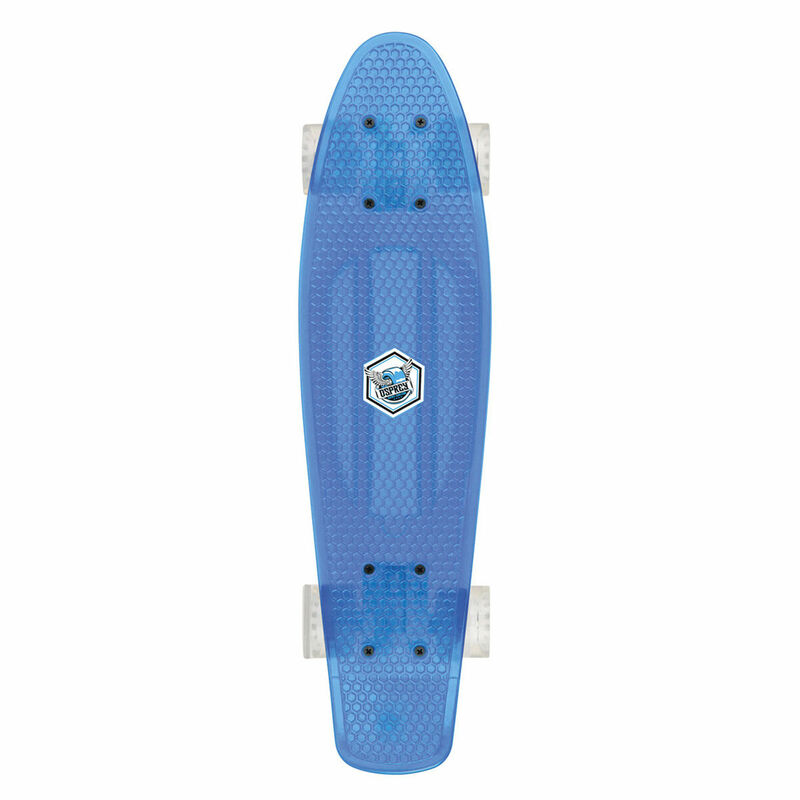 If you’re looking for a skateboard to get you from A to B, cruising down to the shops, college or beach, then a plastic deck retro cruiser is a safe bet, as the lightweight plastic deck makes this easy to carry around when the pavement comes to an end, or class starts. 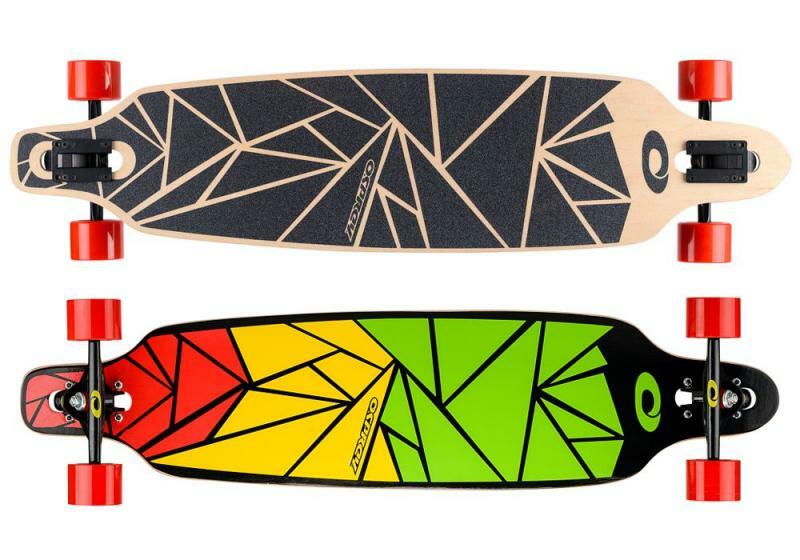 The smaller wheels are also that bit lighter than, for example, a carve board or longboard, but at 45mm wide they still have a relatively wide contact patch ( the part of the wheel in contact with the ground), so you still get some of the grip and stability of a bigger board. 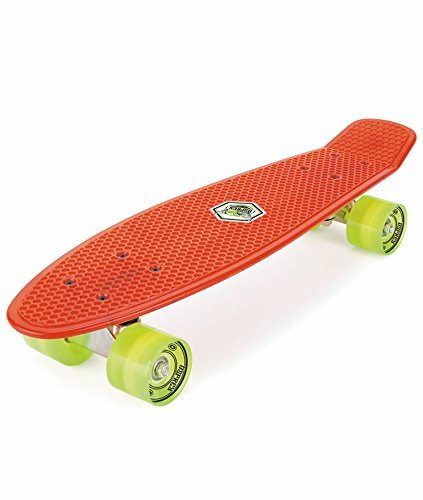 The 22in plastic deck is on the mini side of cruisers, so this really is the perfect getting-around skateboard, and the retro inspired flat deck with single kick tail, and textured plastic grip, gives you control and a bit of manoeuvrability for popping curbs and gaps as you cruise along. 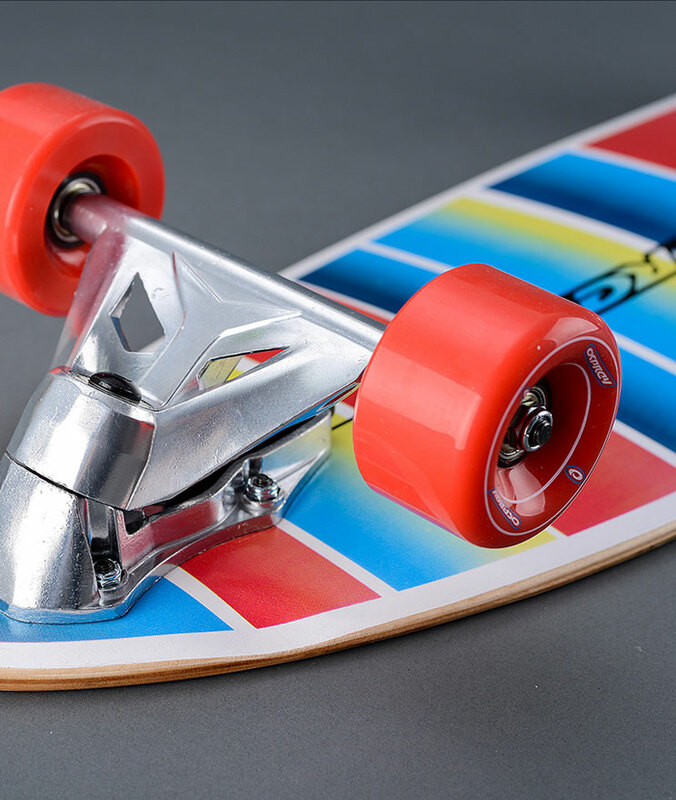 As a complete skateboard setup, Osprey’s plastic retro cruisers come full assembled, with 3 inch aluminium trucks, and chrome ABEC 9 bearings – the highest precision quality in skating. So you’re ready to skate as quick as we can deliver it.